S: Let’s get tattoos for our anniversary. K: Ok – I want an owl. S: I drew you an owl. *sends me a pic of an owl doodle he did on his mousepad. K: LOL, no way! I’m not gonna get that. S: Why not? It’s an owl. K: I changed my mind, I’m getting that owl you drew me on the inside of my heel. S: What – you’re just kidding. K: Nope – I’m gonna do it because when I look at it, it makes me laugh, and I’m doing it to remind myself that life shouldn’t be taken so seriously all the time. We scheduled our appointments and put down our deposits for our 13th anniversary tattoos today. Steve is getting a wind rose on his forearm and I’m getting my owl. 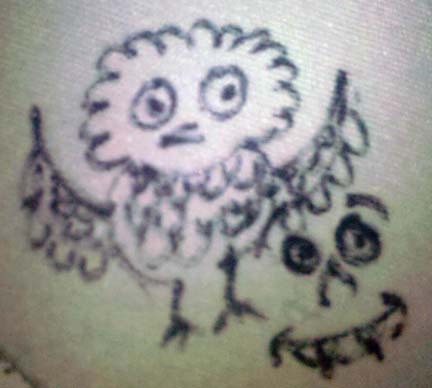 I’m actually getting two owls – the one I had originally thought of on the inside of my leg above my ankle, and Steve probably doesn’t believe me, but I already asked the artist if he could throw in the one my husband drew on my heel. Life doesn’t always have to be so damn serious! Love your unique idea on celebrating your love and history together..